Erwin van Dijk was without a job at the end of the previous episode. However he wasn’t without interest as Vanarama National side Bromley had approached van Dijk to become their manager. In this post, we will see if Bromley became the second club of the series and if not, who will? At the end of the previous post, we saw how Bromley, with just two games left in the season and 5 points adrift of safety, approached Erwin van Dijk to become their manager. It may come as no surprise that van Dijk rejected the job offer. The offer was tempting, no-one ever enjoys waiting around for a job after being sacked on FM. Yet to join a club with next to no chance of survival could have been career suicide. Relegation might have seen van Dijk’s reputation fall ever more and the entire squad would no doubt need overhauling. Immediate promotion would certainly not be guaranteed and a poor start to the season could see van Dijk at risk of a second sacking in two seasons. Instead, van Dijk has chosen the safer option of declining their offer and waiting for a more suitable club to come calling. Van Dijk’s previous experience at many different English clubs seemed to stand him in good stead with many clubs higher up the footballing pyramid. Van Dijk had interviews with a couple of Vanarama National clubs but neither of them chose to appoint him. Summer passed without incident and so the season began with van Dijk remaining unemployed. The thought of moving abroad to find a job, perhaps to Scotland where he spent time with Dundee, or even back to his native home Holland, engrossed van Dijk for a time but moving away from England would seem like a failure after his sacking from Eastbourne. In October 2021 a former club of van Dijk’s approached the manager concerning their vacant managerial position. Plymouth Argyle were relegated from the Championship the previous season and began the League One season in terrible form, slipping to 14th by mid-October. Erwin van Dijk spent three loan-spells with Plymouth and clearly made enough of an impression for them to invite him for an interview. This would be one of, if not the, biggest moments in van Dijk’s managerial career to date. An interview at a club THREE divisions higher than the team who had previously sacked him. Eastbourne must be feeling silly now! Plymouth could clearly see the potential in the young Dutch manager and this was reinforced in an invigorating interview. Plymouth offered van Dijk the job within an hour of their interview. Erwin van Dijk bit their hand off. Plymouth sat in 14th place when van Dijk joined and would be keen to see themselves climb back up the table towards the promotion places. After suffering relegation last season from the Championship, Plymouth would not have expected to find themselves in this position and they’ll be hopeful that their faith in van Dijk can be rewarded. The board have been kind to van Dijk and appreciate the poor start Plymouth have had to the season. As such, they are only expecting Plymouth to finish mid-table this year. One of Erwin van Dijk’s first acts as Plymouth manager was to appoint the assistant manager – Christian Ribeiro. The pair struck up a great friendship at Eastbourne and they’ll be thrilled to rekindle their partnership here at Plymouth. I think it is fair to say Erwin van Dijk has struggled to find his feet with Plymouth. 4 wins in his first 16 matches is unsatisfactory to say the least. Just one clean sheet highlights a significant problem in defence and 24 goals is nothing to shout about. As such, van Dijk set out his targets for the final 15 games of the season. From the final 15 league matches, van Dijk aims to earn …. points as shown in the graphic below. Erwin van Dijk is having a tough time in English football. After struggling with Eastbourne, the Dutchman would have been hoping for a more positive time with Plymouth. Having targetted 28 points from their final 15 games, did Plymouth manage to achieve the desired outcome? You can see that Plymouth failed to achieve the points target van Dijk had in mind. This has seen his side drop to 18th in the table. Had they achieved the desired 28 points, Plymouth could have finished in 11th. 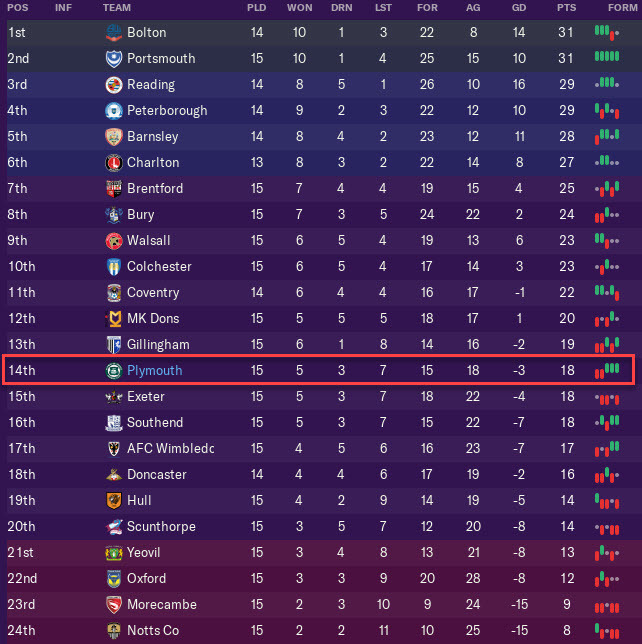 Two losses in the final two games saw Plymouth finish in 18th on 57 points. 2 wins would have seen us finish in mid-table – the board’s expectation upon van Dijk’s arrival. The poor placing in the league has encouraged the board to meet with van Dijk to clarify his position as manager. Initially, the board set van Dijk a nine-point target to achieve at the beginning of next season. However after some persuasion, they have been willing to lower the target to seven points. Prior to the board meeting, I had planned to create a long-term five-year plan for Plymouth, with the overall aim being promotion to the Premier League. This points target has added an unwanted distraction – imagine planning out the next five years only to be sacked after five games! Nonetheless, I will take a bit of time working out how to move forward with Plymouth and will share this in the next post. I hope you have all enjoyed this post! 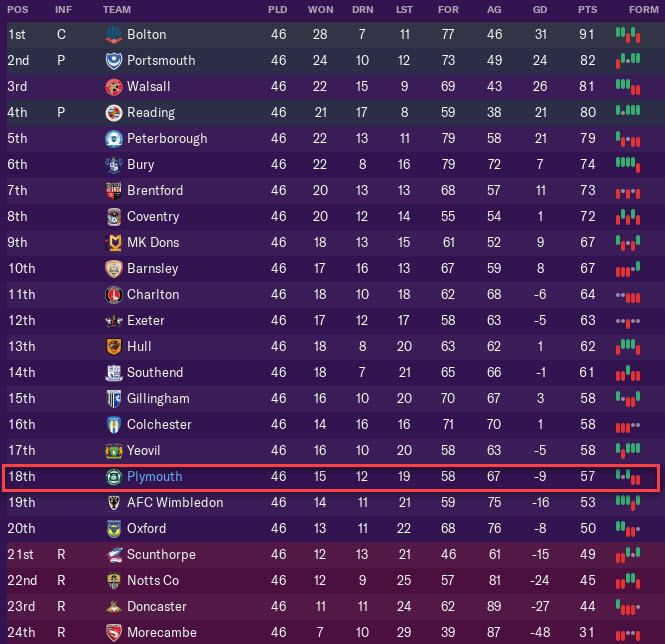 It’s fair to say the past two seasons have been frustrating to play, but this is all part of Football Manager. I’d get bored so easily if winning came easily. The struggle makes success all the more enjoyable. If you want to stay updated with further updates from this blog, follow us. You can find this option in our sidebar. This entry was posted in Achievement Hunter Challenge | @VivaLaVidaFM, FM19 Stories, Football Manager 2019 and tagged achievement hunter challenge, england, erwin van dijk, fm stories, fm19, football manager, plymouth argyle. Bookmark the permalink.